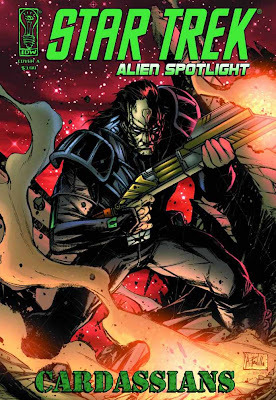 Comics Experience Blog: Star Trek: Alien Spotlight – Cardassians comes out tomorrow! Star Trek: Alien Spotlight – Cardassians comes out tomorrow! Hitting shelves in comic shops everywhere (except the west coast—they have to wait until next week) tomorrow is STAR TREK: ALIEN SPOTLIGHT – CARDASSIANS written by… well, by me—and my brother Arne. I have to say, probably because Arne has been such a great influence as a storyteller, I’m extremely proud of this comic book. It’s a one-shot that, I’ll admit, is pretty set in continuity from the TV show STAR TREK: DEEP SPACE NINE. And working with Arn was great. He’s a real die hard STAR TREK fan and was able to add all these great nuances to the characters that I just would have missed left on my own. Arne is a storyteller in his own right. He lives on the other side of the country from me as a video game animator. But he’s always been involved and story and has been one of my go-to guys as a sounding board for different ideas for years (along with our other brother Craig). Pulling Arn in to co-write this was a great move and he really deserves a lot of credit. The main character in the book we actually created together nearly 10 years ago when Arne ran a STAR TREK roll playing game that I was a member of. We created the character and I liked him so much, I knew I’d want to use him if I ever got the chance. Fortunately, the good people at CBS/Paramount also liked him. So, that’s how the issue came about. And working with Agustin on the art was amazing! He’s one of my favorite rising talents! So, if you’re reading this, go check it out tomorrow! And let me know what you think! Going cold turkey is not recommended as it becomes very likely you will relapse if you try to quit cold turkey. It is also advised that you stay away from people, places, and things in your life related to meth, as these can be triggers for a meth craving. These triggers can include the pipe you smoke meth out of, the tube you snort meth out of, the needle you inject meth out of, friends you get "high" with, places you get "high", and much more. DRAFT STRATEGY AND TIERS:13. mexican shirts It's tempting to think he's going to have a monster year in the Pats' well oiled machine of an offense, but he's leaving arguably the NFL's best well oiled machine, at least in terms of guys putting up fantasy numbers. Cooks now has to compete with Julian Edelman andRob Gronkowski (among others) shirts with sayings on a team that threw eight fewer times per game than the Saints last year, and he'll also have to play his home games outdoors.